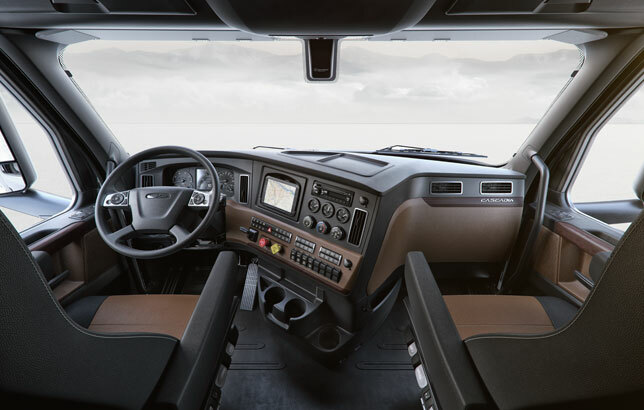 Providing drivers with technologically advanced trucks designed with their comfort in mind and cutting-edge safety features is the first step to driver retention. Drivers play an important role in Real Cost of Ownership (RCO), so Freightliner made driver experience a priority when designing the new Cascadia. Providing drivers with technologically advanced trucks designed with their comfort in mind and cutting-edge safety features is the first step to driver retention. Recruiting and retaining skilled, experienced drivers is also critical to lowering RCO. The important role drivers play in RCO is why Freightliner made driver experience a priority when designing the new Cascadia®. The new Cascadia features triple-sealed doors, an optional insulation package using 3M™ Thinsulate™ technology, and a new engine mount design for better vibration isolation. The engine tunnel cover is now constructed with Quiet Steel®** technology to improve the interior sound level and help drivers focus on the road. The newly designed interior features a low-mounted, ergonomic wraparound dashboard with easy-to-reach switches and steering wheel controls to help keep eyes on the road. The dashboard also includes digital gauges and easily readable information displays to keep drivers informed as they drive. The new Cascadia offers a traditional double bunk arrangement option and a Driver Loft option with a two-seat dinette that folds down for a swing-out full-size bed. In addition, the sleeper area has been redesigned to include larger passenger- and driver-side storage cabinets featuring dimmable LED halo lighting, a wardrobe cabinet with an extra four inches of hanging length, a larger microwave cabinet that will accommodate standard appliances, a larger refrigerator, a sturdy flat-panel TV bracket, and several power outlets. A new front suspension provides a smoother ride and improved roll stiffness for less roll and sway. In addition, the steering gear has been moved forward to help improve steering precision and reduce course corrections. Explore the creature comforts inside the new Cascadia at freightliner.com. The new Cascadia® sleeper ladder, rated up to 400 pounds.